Under The Red Sky is the second in a trilogy of critically acclaimed albums produced by Daniel Lanois that brought Dylan back from the artistic depths of the eighties. This one is generally regarded as the least of the three, forgotten even in the modern Dylan canon. That’s too bad. The predecessor Oh Mercy was overproduced and underwritten, while the follow up Time Out Of Mind was deathly depressing in the way it took the “See That My Grave Is Kept Clean” ethos to exhaustive proportions. 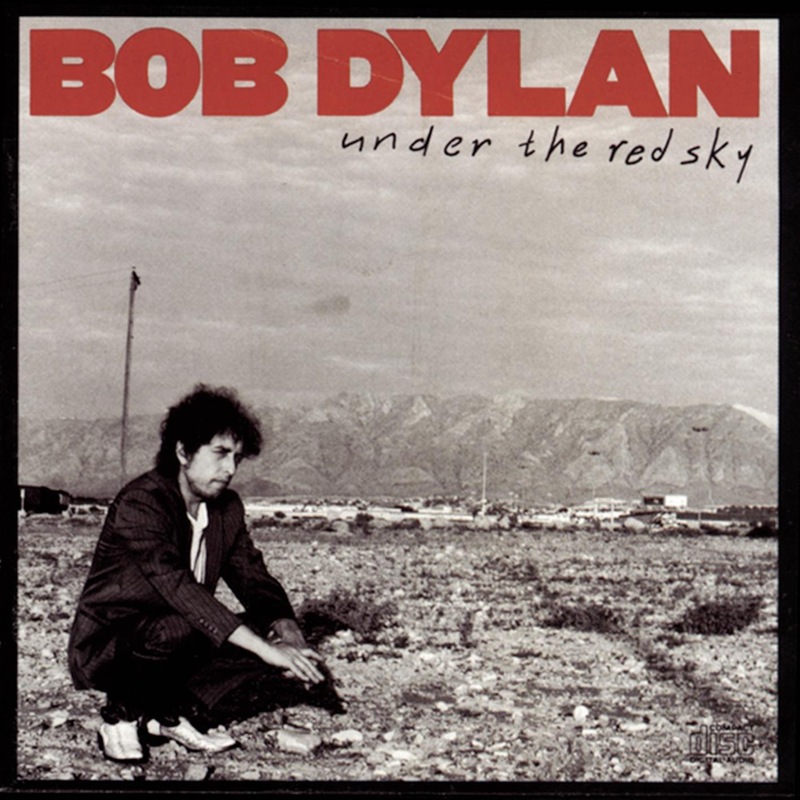 Under The Red Sky is more fun – it reminds me of the Basement Tapes-era Dylan, whimsical and goofy, with a touch of the Christian Dylan, spiritual and very goofy. The production feels more appropriate as well, particularly after the overly Lanois’d Oh Mercy which sounded at times like a bad David Byrne album. This one has lots of swirling organs and bluesy guitars to compliment the quirky songwriting, an attempt to modernize the classic Dylan sound. The songs are pretty silly, though. Most of them. That’s really the critical knock on this album and it’s a fair one. Bob doesn’t help matters by opening the album with “Wiggle Wiggle,” the most commonly cited offender: “Wiggle, wiggle like a bowl of soup/Wiggle, wiggle like a rolling hoop.” But we forget, the peak Dylan of the mid-sixties was very silly too, and his later work is often hampered not by a lack of political or poetic depth but rather that absurd sense of humor. Recall the debut album (“I’ve been around this whole country but I’ve never yet found Fennario”) or Another Side with its rambling faux-blues tunes of compounding absurdities (“I was riding on the Mayflower when I thought I spied some land”) or best of all the Basement Tapes (“Now I come in on a ferris wheel and boys I sure was slick”). I’m not about to argue that Under The Red Sky is infused with the same level of comic genius of the sixties peak, but it’s unique in the modern canon for its playfulness along with some rare nods to that classic period. “Unbelievable” is the sort of righteous blues rock tune that hits all the right notes, humorous, political, or otherwise. The song is filled with quotables: “They said it was the land of milk and honey, now they say it’s the land of money/Who ever thought they’d make that stick?” Some of the lyrics (“Kill that beast and feed that swine/Scale that wall and smoke that vine”) remind me of the Dead’s “US Blues” (“Wave the flag/Pop the bag/Rock the boat/Skin the goat”). Both songs come from a similar place, boogieing cheerfully around the darker corners of the American dream, simultaneously chastising and forgiving with sly humor. “Handy Dandy” is tremendous, my favorite track on the album. It sounds like an early take, or at least the right take, which used to be the rule on Dylan albums. It’s a very silly song. I love the way he has to rush to fit in all the words in the verses: “Handy dandy, if every bone in his body was broken, he would never admit it/He got an all girl orchestra and when he says, ‘Strike up the band,’ they hit it.” The bridge is perfect as well, shifting to a minor key to offer more twisted commentary on the protagonist. Handy Dandy is one of Dylan’s most memorably quirky fictional characters, like Tiny Montomery, the Jack of Hearts, or Jesus. These songs are also not quite as simple as they might seem. I love the bridges on this album, the touches that lift these songs above the childish lyrics, changes to sharps and minors that recall the songwriting style of Blonde On Blonde. The instrumentation on the title track really implements that classic sound, with trademark single note organ runs and deceptively simple lyrical couplets that somehow evoke deeper ripples of meaning. “God Knows” recalls “Down In The Flood” from the Basement era with its apocalyptically spiritual blues, though it would probably sound much better with Robbie and Levon and the boys than in the skeletal demo version here. Then again, wouldn’t nearly every Dylan song sound better with the Band behind him? Still, some of the backing on this album really does sound too polished for this whimsical material, and simpler tracks like “10,000 Men” and “Wiggle Wiggle” could have benefitted from the character and chemistry of a real band. One unfortunate misstep: this version of “Born In Time” is inferior in both composition and production to the outtake from Oh Mercy that floated around on bootlegs until it was released on the Tell Tale Signs compilation. The sound of the original was eerie and ethereal to match the timeless essence of the lyric, which spoke to the human condition that is at once alone and eternally connected: “I walk alone through the shakin’ street/Listening to my heart beat/In the record breaking heat/When we were born in time.” It might be a reflection on a breakup or it might just evoke the meaning of life itself. One of those kinds of songs. Chilling, but not unpleasantly so. The remake is not only an inferior read at a faster tempo, but it also changes the bridge and some of the lyrics. It’s not a disastrous mistake, but the spooky mystery of the original version is gone. The finale “Cats In The Well” is appropriately climactic, with its apocalyptic metaphors: “The cat’s in the well, the wolf is lookin’ down.” The horns are a nice production touch, adding a celebratory tone that somehow feels right. This is a weird album that looks at the worst of the modern world and shrugs, then skips away to whistle a tune. Lots of critics have suggested that Dylan wrote this album for his children, and though the lyrics do have a childlike simplicity, they have an element of danger. London bridges falling down – that sort of thing. These songs are also inimitably and uncoverably Dylan’s, more in the vein of “Tombstone Blues” than “Forever Young.” You don’t see too many of these tunes showing up on tribute albums or film scores. I enjoy Under The Red Sky though it’s hard to recommend without certain qualifications. The comparisons with the classic work are admittedly quite generous, and probably tinted with the fog of a forgiving fan. This is an odd, quirky album without any hit singles or classic songs. Flawed, and probably only really accessible to devotees. But for those who’ve forgotten or overlooked this one should go back, it’s a fun listen. I’m hearing shades of Rolling Stone in that Handy Dandy. Must admit it’s all new to me if it wasn’t Blood on the Tracks generally didn’t listen. Thanks. Good to see neglected album getting its due! Regards from Thom at the immortal jukebox (regular Dylan content).